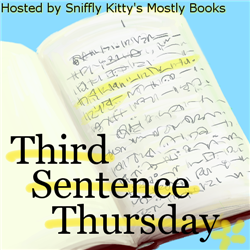 Third Sentence Thursday is a weekly meme for treating third sentences with the diginity they deserve! This week's theme is review the sentence from your current read. 3) Post a link to your sentence here or if you don't have a blog, just post it in the comments! I don't think I can do silly with this one...it's actually kinda deep. (Deeeeeeep, as we say in the church retreats I do.) Obviously, it's about Incarceron, the prison, but it can also relate to life in general...with (most) everything in life, you have to know one to enjoy the other: Pain -- happiness; Ignorance -- Tolerance; Prison -- Freedom. I think in some way, at some point in their life, everyone has felt imprisoned by something, whether it's something that has been done to them, or even something they have created themselves. Freedom comes with breaking free from that. And I think it's always important to remember that even little victories are important. If you must, free yourself a little more every day. Congratulations–you won the Stylish Blogger award! Check out my blog for details.